Tavish is an active and fun-loving 3-year-old little boy who loves the outdoors, animals, Matchbox cars, and jumping on the family trampoline. Given his normal high levels of activity, Tavish’s parents were not initially concerned when they noticed a few bruises on his body. However, it became clear that something was not right when the bruises started becoming larger, followed by the appearance of more bruises that could not be explained. After Tavish suffered a fall, his parents took him to the doctor to get things checked out. Tests were done, and the results were shocking. On October 2, 2018, Tavish was diagnosed with acute lymphoblastic leukemia (ALL). Doctors explained that Tavish’s white blood cell count was so high that he fell into the category of “very high risk.” Tavish received two blood transfusions, along with a bag of platelets. He endured a bone marrow biopsy and surgery to install a port for chemotherapy treatment. Tavish began a 9-month long chemotherapy treatment plan. However, further tests have revealed an additional diagnoses of “mixed-lineage leukemia,” which makes it difficult to know how Tavish’s body will respond to treatment. Tavish receives treatment at Seattle Children’s Hospital every week, nearly two hours from his home in Ellensburg, WA, and has had to be hospitalized at times due to complications. 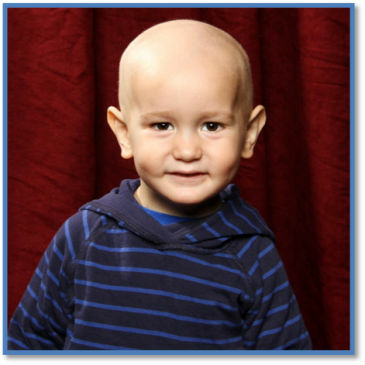 Although Tavish has a long road ahead of him, he is a fierce little fighter who is determined to win this battle. Tavish will be adopted as a Sparrow to Cle Elum-Roslyn School District. Students at Cle Elum-Roslyn Elementary, Walter Strom Middle School, and Cle Elum-Roslyn High School will work hard to raise money for Tavish through sponsored community service and fundraising projects.